Cooking a turkey so that it tastes great starts by getting your turkey from a quality butchers, like Meat No Veg. Take your turkey out of the fridge, unwrap it and allow it to warm up for at least 40 minutes before cooking. Remove the string that holds the legs together so that the legs are loose. Before you start cooking a turkey pre-heat the oven and make sure it has reached the desired temperature (see cooking turkey times table). Smear a little butter over the base of a roasting tray add some more butter on the skin of the bird and season with salt and pepper. If required place fatty bacon over the body of the bird to help it stop drying out. Loosely cover the bird with foil. Place the turkey in the roasting tray, breast side up. To work out how long to cook a turkey weigh it after stuffing and use our cooking turkey times table provided. Baste the turkey a few times during cooking using its own juices. Take the foil off 40 minutes before the end to brown. Check the turkey is cooked by using a temperature probe or a flat knife. Insert the flat knife (or skewer) into the thickest part of the meat, then take it out and press the surface hard with the side of the knife (or skewer) and watch what colour the juices are that run out. If it is clear then the turkey is done. Take the turkey out of the oven then wrap in foil to keep it warm. Place in a warm spot and allow the meat to rest or relax for 15-20 minutes before serving. There you have it, how to roast a turkey. Cooking a turkey made simple. Try next time when planning your roasting times ensure your basting times are more frequent. 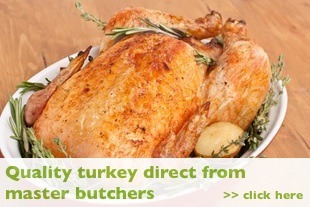 Check your oven temperature and ensure you buy your turkey from a quality butchers like Meat No Veg. Carving a turkey is not that difficult. Once the turkey has cooled down and the juices reabsorbed into the meat, take a long, sharp carving knife and use a clean napkin or fork to steady the bird whilst you´re carving. Remove the drumsticks then slice through the thigh meat from the bone. Next, place the knife horizontally at the bottom of the bird´s breast and cut towards the rib cage to loosen the meat. Then cut from the top down alongside the rib cage. Now cut down vertically into the breast to produce thin and appealing medallion slices.